Monthly Meeting, May 17th, Wednesday, 7 PM at David Jeang’s House. Want to join us? All are welcome! On May 17 we will welcome any new members, discuss campaign and party building, and also teach how to petition! Montgomery County Greens at the County Council Fossil Fuel Divestment hearing. Tim Willard testified! This page contains older material from the current events page. Monthly Meeting, Dec. 13, 7 PM at Mary Rooker’s house. NOV 25 DAPL Protest is cancelled. We regret any inconvenience. Election day is upon us. We need people to put signs up at polling places Monday night and to be at those places Tuesday. Here is a link to a signup form where you can choose sites you can go to on Tuesday, please email us at mocogreens@gmail.com if you can help put up signs. Jill Stein will be coming to the metropolitan Washington area and we will have a rally for her at the University of Maryland at College Park, Sunday, November 6 at 1pm. The rally will be held at the Nyumburu Amphitheatre, a beautiful open-air location. Dr. Margaret Flowers, the Green senatorial candidate for Maryland, will also be speaking. Sign up here: Campaign Events on Jill’s website. The event will go on rain or shine. If it rains, it will be held right next door at the Grand Ballroom of the Stamp Student Union building, a large ballroom that can seat more than a thousand people and even more standing. Please begin to join us at 12:30 and we will have great music for you to listen to and then our program will begin at 1pm. More information about the details of our program will appear on this website shortly. It’s free admission of course and there is plenty of free parking at lots a few minutes away from the Amphitheatre. The closest free lots are 1b and z on Alumni Avenue. The Nyumburu Amphitheatre is located at 4018 Campus Drive, College Park. We encourage you to RSVP for this event as soon as possible to help us with planning the event and also as a show of support for Jill and to encourage others to come to the rally too. We will be at the Kensington Labor Day Parade, from 9-1. See http://tok.md.gov/event/49th-annual-kensington-labor-day-parade-and-festival/?instance_id=1228 for more information about the parade. We will have a meeting Tuesday August 30th at Mary Rooker’s house, at 7 PM. We will be planning the picnic which will be on September 18th. Directions. contact mocogreens@gmail.com with any questions. We are assigned to Division 7 in Takoma Park’s 2016 July 4th Parade. Division 7 assembles on Lee Avenue and the Division Director there to help you will be Ed Koren. All main roads around the parade route will closed at 9:00am. We ask that your group arrive at your staging area between 9:00am and 9:30am to ensure that the parade can start on time. Parking is limited, so we encourage you to carpool or to park at one of the designated parking lots and walk to the staging area if you can. Please make sure to leave enough time to find parking and/or walk to the staging area, and still arrive before 9:30am. Contact mocogreens@gmail.com with any questions! 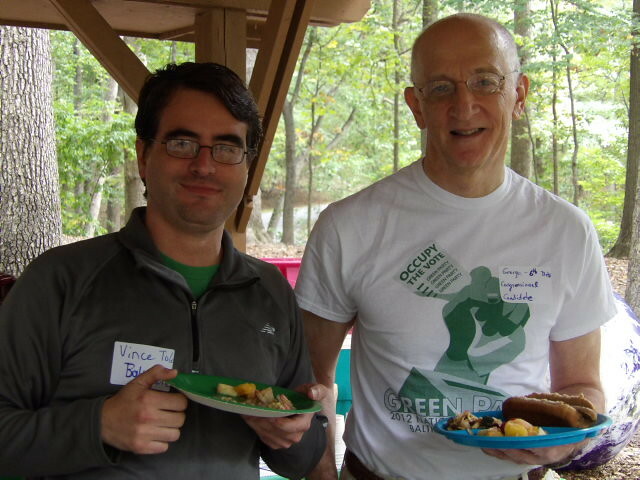 Yesterday, May 1st, we had a vote count party for the Maryland Green Party’s mail-in primary election. We had Greens seeking the party nomination for 5 out of the 8 US Congressional Districts in MD (including 3 candidates running in our first contested primary, in the 8th district), as well as 1 candidate for a Senate seat. We used Ranked Choice Voting (Google it! ), which Greens advocate using in all elections. A nonpartisan volunteer from FairVote attended to witness and certify the integrity of our process. 75 ballots were returned to us. A small number in comparison to what the Big Two parties get, but greater than the elections we’ve held in the past. The 8th Congressional slot was won by Nancy Wallace, who won a three way contest against Elizabeth Croyden and Charles “Teddy” Galloway III. Our video of the vote counting in the interests of transparency is available here. Full results of the Md. GP primary for the senate and congressional races: 65 votes cast in Baltimore for city candidates, and for Senate, and Congressional Districts 3 and 7. There were 68 votes from the rest of the state. Want a break from all the national primary madness, and to talk directly to some real, honest candidates? Come to the Montgomery County Green Party meeting this Tuesday, where you can meet most of the six Congressional candidates running as Greens in our county’s three Congressional Districts! You can also find out how to vote in the Green Party primary, April 3-30! The U.S. Senate recently passed in haste an amendment to an energy bill, which would undermine all our efforts to make U.S. greenhouse gas reduction targets real. The amendment requires EPA to ignore the findings of its own scientists and pretend that burning forests to produce energy is carbon neutral. To pretend these greenhouse gas emissions don’t even exist. First, it sets a terrible precedent for Congress to insist that we ignore science on climate change. Second, burning forests for energy is so inefficient that it actually has higher greenhouse gas emissions than coal. Third, it sets a terrible example for the U.S. to promote this lie when we are trying to get other nations to protect their forests. This lie has already done enormous damage. We have clear cut 350,000 acres of coastal forests in the American southeast, and ship 4 million tons of wood pellets every year across the Atlantic to be burned — because Europe has a law pretending that forest biomass is carbon neutral! That way European nations can pretend to meet their climate agreement obligations when they don’t. We don’t want to be doing the same thing in the U.S. The amendment has already passed, but we have a decent chance of stopping the energy bill altogether, because of other entanglements. Please call Senator Cardin at 202-224-4524 and ask him to do whatever he can to stop final passage of S 2012, the Energy Policy Modernization Act. It’s better to call than to email, since emails can be mass produced. Cardin has an excellent environmental record, but even so, he may not have a clue how bad this amendment is. We need to mobilize all our climate champions to show active leadership in stopping this bill. I’m attaching a fact sheet about forest biomass in case you want to review this issue. Please send this alert on to others, in or out of Maryland. Anyone can reach their Senators by calling the capitol switchboard at 202-224-3121. February monthly meeting will be on Tuesday, Feb. 23 at 7 PM at George Gluck’s house. NOTE CHANGE OF LOCATION! George lives at 4848 Sweetbirch Drive in Rockville. Topic will be next steps on IGCC green building code for Montgomery County . Sign this petition to have Mo. Co. adopt the Int’l Green Construction Code: This is IMPORTANT! MONTHLY MEETING MONDAY, DECEMBER 14, 7PM AT JOHN HOLLAND’S HOUSE – DIRECTIONS HERE . GEORGE GLUCK and TIm willard testifying before state reps 11-18-2015.
we’ve created a “Healthy Lawns addendUm” you can put on your community’s contract, to ensure freedom from cancer-causing pesticides this coming year. IT is in our documents PAGE. MONTHLY MEETING MONDAY, NOVEMBER 16, 7PM AT MARY ROOKER’S HOUSE – DIRECTIONS HERE – THIS meeting will include a talk by bruce baker on the tenants’ rights bill. We will be at the Takoma Park Street Festival this Sunday, and we could use help at our table. Visit our SignUp page and let us know if you can spend some time at the table! If you like this, you might want to check out http://ygus.org – The Young Greens Caucus.